SOUTHWEST COLORADO—On Wednesday night, Nov. 14, two crashes closed portions of US Highway 491 and US Highway 550—the latter of which remained closed as of 6 a.m. Thursday, Nov. 15. Just after 8 p.m. Wednesday, Nov. 14, crews closed US 550 south of Silverton (mile point 70) after a semi-truck crash. It remains closed due to fire concerns. Note that there are no health hazards or concerns. Expect the highway to remain closed until crews remove the semi. 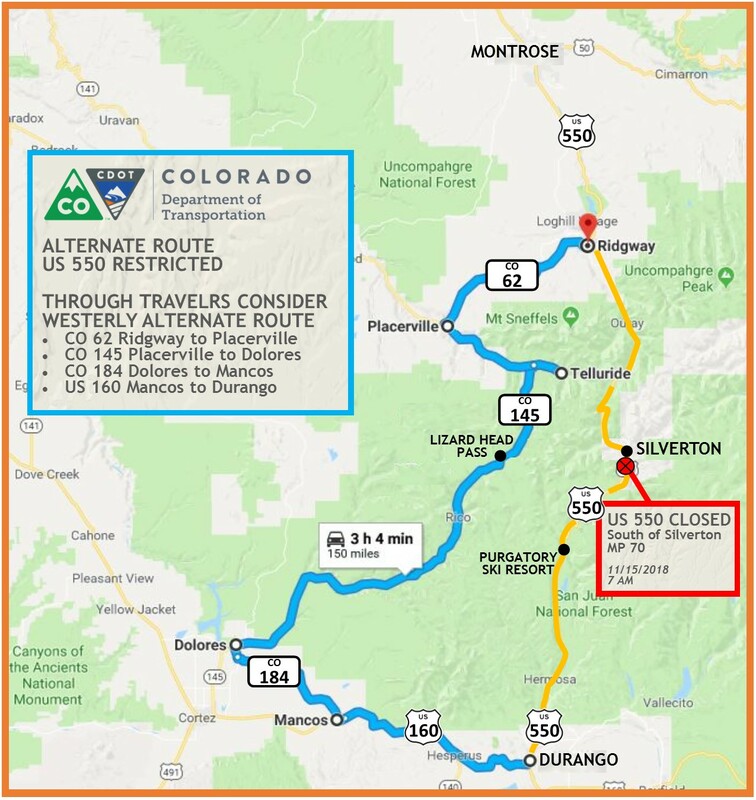 Those traveling in both directions of US 550 between Durango and Ouray should consider an alternate route via Colorado Highway 145 through Telluride. About 8 p.m. Wednesday, Nov. 14, crews closed US 491 about five miles north of the New Mexico state line following a semi-passenger vehicle crash, in which one person was killed. While crews opened the highway about midnight, travelers are urged to drive cautiously as the semi-truck remains on the side of the highway. The semi will likely be towed today, which may require another highway closure.